Will They Cut Your Head Off? The name Mazar-i-Sharif — literally, “The Main Mausoleum” — is derived from the mausoleum of Ali, the forth caliph of Islam, Muhammed's son-in-law, and the origin of Shiism. Actually, Ali has been killed near Baghdad in Iraq in 661, and that is the place where he has been buried. According to the Afghans, however, his body was put on a white camel that ran until she has died, and that was the burial place of Ali — right at Mazar-i-Sharif. The exact location has been subsequently forgotten, but in the 12th century a local mullah had a dream pointing to the grave. In 1136 a mausoleum was built there, but Genghis Khan has destroyed it, and it has been lost again. Luckily, another omen has pointed to the specific location, and the present structure has been built there in 1481. Outside of Afghanistan, nobody else believes this story. 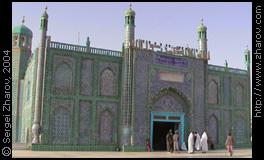 In 1866 Mazar-i-Sharif was declared the capital of Afghan Turkestan, and from a small village it has consequently turned into one of the major Afghanistan cities. Along the eastern fence of the mausoleum there are Barat and Barat–2 hotels. Both are the foreign morons' demoneying centers. They ask for the standard 50 dollars and do not go lower than 30 dollars despite the absence of any clients. Near the center of the southern fence there are three cheap hotels. Two are on the street that follows the fence, and one is on the perpendicular street. Of these three two are called Aamo and Aria, and I do not remember which one of them is on the perpendicular street, but that was where I stayed, and it is a tolerable place. They charge 10 dollars. The bathroom is communal, and there is no running water. The building next to it has a restaurant. There are many grocery vendors on the street, but the police periodically disperse them. Following further south along this street you will find a couple of restaurants. You can proceed behind the outer fence of the mausoleum without any problems. Then you will be harassed by an evil-looking guy with tickets who wants you to give him five dollars to enter the inner fence or to take pictures. Do not give him anything; this is an outrage. Non-Muslims can not enter the mausoleum anyway. As for the pictures, your group should spread, and then some of you can take photos while the others take the flak from the ticket man. Another reported con scheme is charging you five dollars to register you. What registration? There is a flee market on the sidewalk along the outer fence. You can buy “old” coins there, American field rations, and various Soviet paraphernalia like army boots, belts, etc. The latter items are surplus equipment rather than combat trophies. In the middle of the western side of the fence you can exchange currency. The perpendicular street that starts there is where they sell tickets for jeeps to Herat. The jeeps depart from here, too, at 4–5 a.m.
A food market is located at the southwestern corner, and there are a few grocery stores in this area. The northeastern corner is where the post office is. You can buy stamps and mail postcards from here. A large market starts here and goes far to the north, but there is nothing of interest there. A few carpet and souvenir shops are located near Barat Hotel. For many reasons, people are not of the best quality here. You should visit Mazar-i-Sharif to see Balkh and Salang Pass, but the city itself does not warrant any attention. People here can quickly spoil your mood. Zarathustra was born here three thousand years ago. Alexander the Great has established his headquarters in Balkh in 329 B.C. Then they had lots of Buddhist temples here and a Buddha statue covered with precious stones. After the advent of Islam, Balkh remained an important cultural center, but in 1220 it was completely destroyed by Genghis Khan. It was rebuilt in the 18th century, but with the political center being moved from it to Mazar-i-Sharif, Balkh has gradually turned into an unimportant village. But it still has a few interesting historical things. Three of them are in the central park. The tomb of Khwaja Parsa: he was an Islamic scholar and died here in 1460. The tomb, combined with a mosque, is very nice. Madrassa of Sayid Subhan Quli Khan: it was built in the 17th century, but all that remains now is parts of the walls and a nice arch. The tomb of Rabi'a Balkhi: she was a poet, and her brother slashed her wrists for an affair with a wrong guy, and she wrote her last poem with her own blood. There are ancient ruins in the northwestern part of the city, Bala Hissar. They are almost 2000 years old. You can not see much since everything is covered by earth, but the general layout of the city walls is clear. You can find pieces of ancient ceramics here. The locals sell the best preserved things in the central park, but their authenticity is not clear. Right before you enter Balkh coming from Mazar-i-Sharif, there are parts of the ancient city wall and two huge mounds — remnants of a Buddhist monastery and a stupa mentioned in documents as old as 630. 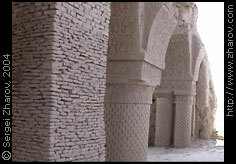 Besides the tomb of Khwaja Parsa, Masjid-i-No Gumbad is the best preserved monument in Balkh. The name means The Mosque of Nine Domes, and it was built in the beginning of the 9th century. The domes are exactly what has not survived, but what is there looks interesting. The site is protected by a metal roof. To get here you have to turn left on the main road even before you enter Balkh, then continue for about 2 km. Balkh is 18 km from Mazar-i-Sharif. While there is local transportation covering the distance, it is easier to hire a taxi for a few hours because finding all these places and moving between them is not easy. Three hours should be enough, and you can hire a car for about 10 dollars for this much time. To Kabul: seven hours and 11 dollars. To Herat you can get in an exciting trip over an unpaved road. A jeep rides for three full days — 12 hours each day. You spend two nights sleeping on the roofs of caravan-serais for free, watching the stars. I liked it a lot. A ticket is 18 dollars.